Many physicists have extremely fond memories of their time as a summer student at labs like DESY in Germany or CERN in Switzerland. Some even describe it as pivotal because they decided to choose particle physics as their area of specialisation after being immersed in a real research environment, surrounded by people with the same goals, having their own research project to work on and making lots of new friends. One project at DESY that receives summer students every year is the analogue hadronic calorimeter prototype. 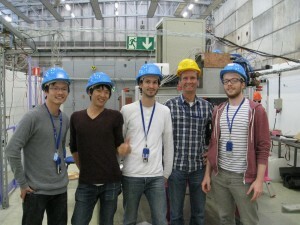 And it seems to be one of those that inspires students to stay in particle physics: at a recent test beam of the calorimeter at CERN, four consecutive generations of former DESY summer students (and their supervisor) were around to take shifts and data. From left to right: Lloyd Teh (University Shinshu, summer student 2014), Shion Chen (University of Tokyo, summer student 2013), Eldwan Brianne (DESY, summer student 2012), Mathias Reinecke (DESY, AHCAL electronics and summer student supervisor), and Oskar Hartbrich (DESY, summer student 2011).